I love daylight saving. It’s fantastic being able to enjoy some sunshine after work and have enough light left to go for a walk in the evenings but right now I am a little grumpy about the time change because daylight saving stole and hour of my sleep. Being a bit more tired than usual today I opted for a quick and easy dinner – Shrimp with Broccoli from eatingwell.com served on quinoa. This stir-fry fit what I had in mind for my tea: fast, healthy and light but I was a little disappointed by the flavour. The shrimp is stir-fried in a little oil, garlic, crushed red pepper and added to steamed broccoli and a sauce. The sauce has vegetable stock, lemon and basil and is thickened with a little cornflower. I wanted the sauce to have a little more flavour. I think I’d make this again but would add a little lemon zest to give it some zing. During the weekend I whipped up a batch of Banana Blueberry Granola. I love home made granola. It smelt so delicious as I was baking it in the oven. The whole house was filled by its aroma and I couldn’t wait for it to cool enough for me to sprinkle it on top of my yoghurt. This recipe is adapted from Allie’s Quinoa Banana Bread Granola. I have cut down the sugar a little and added some dehydrated blueberries I got from Farro’s– yum! Having banana in a granola recipe may seem unusual but it adds a subtle sweetness and helps the oats and quinoa form tasty little clusters. Guess who’s back… Back again..? Sorry for my abrupt break in blogging. A trip back home for graduation and then feeling not too flash has meant that I haven’t spent much time in the kitchen at all so I enjoyed having a bit of a play this evening. After eating more convenience foods and restaurant food than usual I wasn’t that inspired to cook but I’m always so surprised how much I enjoy eating fresh, healthy food after having a break from it. Tonight I needed to cook up some snapper I bought the other day and had been eyeing up the laksa paste in my fridge so I decided to poach the snapper. I have never poached fish before and I have no idea if this is anything close to the “correct” method but I do know that it worked, it was delicious and it was speedy. Please feel free to let me know if there is a better way of doing this! 3. Top with spring onion and capsicum flakes. 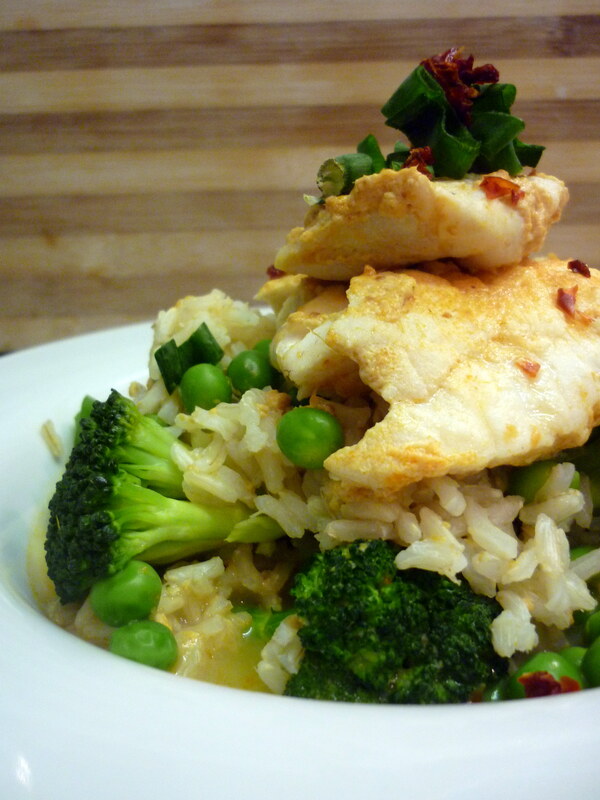 I served my fish over brown rice, broccoli and peas and spooned some of liquid the fish cooked in. Some fresh coriander and a touch of chilli would have given this meal a real boost.